Cursive writing is slowly being erased out of schools in America as schools set their focus towards keyboarding. Cursive writing has become an ancient form of writing, while keyboarding, texting, and emailing are shaping the future for children. 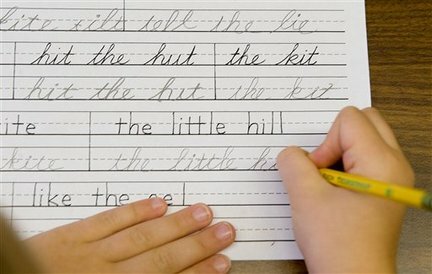 The initiative to remove classes that teach cursive writing is headed by the Common Core standards, which is used in 45 states including the U.S. Virgin Island and the District of Columbia. Cursive is not apart of the standards, but keyboarding is. Keyboarding has become the newest and most popular form of writing. Kids are using computers more than they are writing now. Cursive is a form of writing that allows you to write more quickly and save time. Personally, I never enjoyed cursive and I do not use it today. I’m a journalist, and I find it quicker for me to write in print than cursive. They are both hard to read after I’m done writing, but I can understand the print much easier. Shouldn’t legible writing be more important than the speed of writing? I think it is important for kids to learn keyboarding—much more important than cursive. Typing on a computer has become a necessity in life. You have to use it to type papers all throughout school, and you can find it being used in most careers. Keyboarding has become part of the future, and cursive is just an ancient art now.